<h2>Plasma accelerators could overcome size limitations of Large Hadron Collider</h2><br /><p>If you know what a particle accelerator is, you probably think first of the Large Hadron Collider (LHC) – that gargantuan ring on the Franco-Swiss border that smashes protons and ions together, exposing the secrets of the subatomic world.</p> <p>Built by the European lab CERN, the LHC accelerates particles to the kinds of speeds found during the eruption of the early universe. To do so, it needs a very, very big circumference – 27 kilometres.</p> <p>Yet the LHC is already finding limits to what it can explore. Physicists want even more powerful accelerators –&nbsp;but building one much bigger than the LHC is hard to contemplate.</p> <p>Dr Ralph Assmann, a leading scientist at the German particle physics lab DESY, believes a completely different approach is needed. He thinks accelerators can be powerful, yet up to 1,000 times smaller, if they are based on a strange type of matter known as a plasma – a cloud of negative electrons and positive ions.</p> <p>‘Plasma accelerators provide a path to energies beyond the LHC,’ he said. ‘Particle physicists must take this opportunity very seriously.’</p> <p><strong>Swing&nbsp;&nbsp;&nbsp;&nbsp;&nbsp;&nbsp;&nbsp;&nbsp;&nbsp;&nbsp;&nbsp;&nbsp;&nbsp;&nbsp;&nbsp;&nbsp;&nbsp;&nbsp;&nbsp;&nbsp;&nbsp;&nbsp;&nbsp;&nbsp;&nbsp;&nbsp;&nbsp;&nbsp;&nbsp; </strong></p> <p>Conventional accelerators work by sending charged particles through oscillating electromagnetic fields. By switching back and forth, these fields kick the particles to an incrementally higher energy with every cycle – a bit like pushing a child on a swing.</p> <p> <div class="quote-view quotesBlock quote_horizontal"> <div class="quotesTop"><img src="https://horizon-magazine.eu/sites/all/themes/horizon/images/quotes_top.png" alt="" title="" /></div> <p>'Particle physicists must take this opportunity very seriously. '</p> <blockquote><p>Dr Ralph Assmann, Leading Scientist, DESY</p></blockquote> <div class="quotesBottom"><img src="https://horizon-magazine.eu/sites/all/themes/horizon/images/quotes_bottom.png" alt="" title="" /></div> </div> </p> <p>The trouble with this approach is that the individual kicks – which are generated by electrical components –&nbsp;can only be so powerful, or the field itself will break down. High energies therefore demand lots and lots of soft kicks, which is why conventional accelerators get so big.</p> <p>Plasmas, however, can sustain much bigger fields. Nearly 40 years ago, physicists discovered that if a laser pulse or a particle beam is sent into a plasma, it is possible to momentarily separate the negative and positive charges, generating a field of some 100 billion volts per metre.</p> <p>Any electrons stranded in the wake of this separation are propelled forwards. The effect, like a surfer riding a wave, is known as plasma wakefield acceleration.</p> <p>In recent years, the energies accessible with plasma wakefield accelerators have risen sharply. Scientists like Dr Assmann want to increase these energies, but also to improve the stability and quality of the electron beams coming out of the accelerator.</p> <p><strong>Host of applications</strong></p> <p>That would make plasma accelerators suitable for particle physics but also a host of other applications, including cancer treatment, medical diagnostics, security scanners and the study of advanced materials. Conventional accelerators already help with these applications, but their size and cost means that demand currently far outstrips supply.</p> <p>Dr Assmann is coordinating a project, EuPRAXIA, to come up with a design for the world’s first plasma wakefield accelerator with an energy of five giga-electronvolts (GeV) that can actually be used for research. That is less than one-thousandth the energy of the LHC but, as Dr Assmann points out, you have to walk before you can run.</p> <p>‘Clearly, high-field accelerators, like plasma accelerators, (are) the logical long-term solution for advancing the energy frontier in particle physics,’ he said. ‘But it will require a realistic and sustained approach.’</p> <p><img class="@alignleft@" title="A two-storey design limits the length of the 5 GeV EuPRAXIA plasma accelerator facility, although it could extend to 35-250m depending on what applications are added downstream. Diagram not to scale. Image credit - Horizon" src="https://horizon-magazine.eu/sites/default/files/PlasmaAccelerator-01.png" alt="A two-storey design limits the length of the 5 GeV EuPRAXIA plasma accelerator facility, although it could extend to 35-250m depending on what applications are added downstream. Diagram not to scale. Image credit - Horizon" width="983" height="787" /></p> <p>With 40 labs and universities on board, EuPRAXIA will have to answer key questions, such as whether all the accelerated electrons should come from the plasma, or whether additional electrons should be fed into the machine. The design is expected to be completed towards the end of next year.</p> <p>EuPRAXIA is not the only plasma accelerator project in town, however. At CERN, a powerful wakefield accelerator called AWAKE has already been built, but with a twist –&nbsp;it uses a proton beam to drive it.</p> <p><strong>Bigger impact</strong></p> <p>Protons are more than 1,800 times more massive than electrons, which means they have a much bigger impact when it comes to dividing the charges in a plasma. According to Dr Edda Gschwendtner, the CERN project leader of the AWAKE experiment, that means a proton-driven plasma accelerator could accelerate electrons to high energies in just a single stage, rather than multiple stages, as is often proposed.</p> <p>AWAKE takes the proton beam from one of CERN’s existing accelerators, and in the last two years has successfully created strong plasma wakefields. This year, the goal is to actually accelerate electrons in that wakefield to energies exceeding 1 GeV.</p> <p><img class="@alignleft@" title="The AWAKE experiment uses a proton beam to create a strong plasma wakefield. Image credit - CERN" src="https://horizon-magazine.eu/sites/default/files/cern_accelerator_0.jpg" alt="The AWAKE experiment uses a proton beam to create a strong plasma wakefield. Image credit - CERN" width="1440" height="960" /></p> <p>In years to come, Dr Gschwendtner wants to boost AWAKE’s output to several tens of GeV. That would be enough to probe certain theoretical proposals of today’s particle physics –&nbsp;dark photons, for instance, which some physicists believe could constitute the dark matter that predominates in the universe.</p> <p>Plasma accelerators still have a long way to go before they can out-perform the likes of the LHC. But when conventional accelerators are so big and costly, Dr Gschwendtner believes they could be the only way forward.</p> <p>‘New technologies must be developed,’ she said. 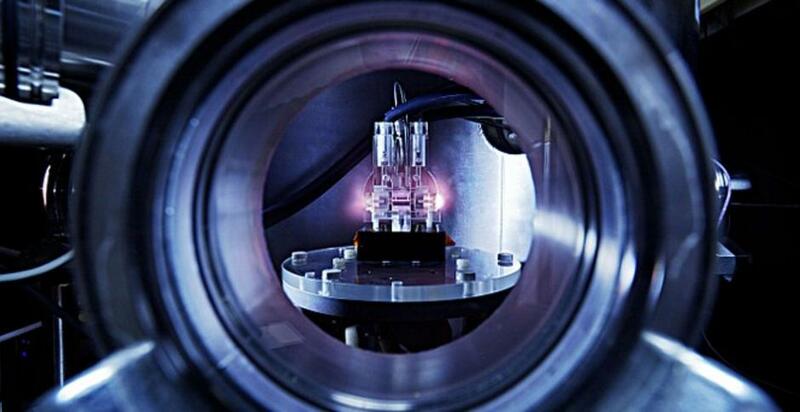 ‘Plasma wakefield acceleration is a very promising novel accelerator technique.’</p> <p><em>The research in this article has received EU funding. If you liked this article, please consider sharing it on social media.</em></p> <p><a href="http://bit.ly/newsalertsignup" target="_blank" rel="noopener noreferrer"><img src="https://horizon-magazine.eu/sites/default/files/news-alert-final.jpg" alt="" width="983" height="222" /></a></p> <br /> <img src=”http://www.google-analytics.com/collect?v=1&tid=UA-40077089-1&cid=plasma-accelerators-could-overcome-size-limitations-of-large-hadron-collider&t=event&ec=republish&ea=read&el=plasma-accelerators-could-overcome-size-limitations-of-large-hadron-collider&cs=republish&cm=republish&cn=republish&cm1=1" /> This post <a href="https://horizon-magazine.eu/article/plasma-accelerators-could-overcome-size-limitations-large-hadron-collider.html">Plasma accelerators could overcome size limitations of Large Hadron Collider</a> was originally published on <a href="https://horizon-magazine.eu/">Horizon: the EU Research &amp; Innovation magazine | European Commission</a>. If you know what a particle accelerator is, you probably think first of the Large Hadron Collider (LHC) – that gargantuan ring on the Franco-Swiss border that smashes protons and ions together, exposing the secrets of the subatomic world. Built by the European lab CERN, the LHC accelerates particles to the kinds of speeds found during the eruption of the early universe. To do so, it needs a very, very big circumference – 27 kilometres. Yet the LHC is already finding limits to what it can explore. Physicists want even more powerful accelerators – but building one much bigger than the LHC is hard to contemplate. Dr Ralph Assmann, a leading scientist at the German particle physics lab DESY, believes a completely different approach is needed. He thinks accelerators can be powerful, yet up to 1,000 times smaller, if they are based on a strange type of matter known as a plasma – a cloud of negative electrons and positive ions. Conventional accelerators work by sending charged particles through oscillating electromagnetic fields. By switching back and forth, these fields kick the particles to an incrementally higher energy with every cycle – a bit like pushing a child on a swing. The trouble with this approach is that the individual kicks – which are generated by electrical components – can only be so powerful, or the field itself will break down. High energies therefore demand lots and lots of soft kicks, which is why conventional accelerators get so big. Plasmas, however, can sustain much bigger fields. Nearly 40 years ago, physicists discovered that if a laser pulse or a particle beam is sent into a plasma, it is possible to momentarily separate the negative and positive charges, generating a field of some 100 billion volts per metre. Any electrons stranded in the wake of this separation are propelled forwards. The effect, like a surfer riding a wave, is known as plasma wakefield acceleration. In recent years, the energies accessible with plasma wakefield accelerators have risen sharply. Scientists like Dr Assmann want to increase these energies, but also to improve the stability and quality of the electron beams coming out of the accelerator. That would make plasma accelerators suitable for particle physics but also a host of other applications, including cancer treatment, medical diagnostics, security scanners and the study of advanced materials. Conventional accelerators already help with these applications, but their size and cost means that demand currently far outstrips supply. Dr Assmann is coordinating a project, EuPRAXIA, to come up with a design for the world’s first plasma wakefield accelerator with an energy of five giga-electronvolts (GeV) that can actually be used for research. That is less than one-thousandth the energy of the LHC but, as Dr Assmann points out, you have to walk before you can run. With 40 labs and universities on board, EuPRAXIA will have to answer key questions, such as whether all the accelerated electrons should come from the plasma, or whether additional electrons should be fed into the machine. The design is expected to be completed towards the end of next year. EuPRAXIA is not the only plasma accelerator project in town, however. At CERN, a powerful wakefield accelerator called AWAKE has already been built, but with a twist – it uses a proton beam to drive it. Protons are more than 1,800 times more massive than electrons, which means they have a much bigger impact when it comes to dividing the charges in a plasma. According to Dr Edda Gschwendtner, the CERN project leader of the AWAKE experiment, that means a proton-driven plasma accelerator could accelerate electrons to high energies in just a single stage, rather than multiple stages, as is often proposed. AWAKE takes the proton beam from one of CERN’s existing accelerators, and in the last two years has successfully created strong plasma wakefields. This year, the goal is to actually accelerate electrons in that wakefield to energies exceeding 1 GeV. In years to come, Dr Gschwendtner wants to boost AWAKE’s output to several tens of GeV. That would be enough to probe certain theoretical proposals of today’s particle physics – dark photons, for instance, which some physicists believe could constitute the dark matter that predominates in the universe. Plasma accelerators still have a long way to go before they can out-perform the likes of the LHC. But when conventional accelerators are so big and costly, Dr Gschwendtner believes they could be the only way forward. The research in this article has received EU funding. If you liked this article, please consider sharing it on social media.